In the Vedas the mantra (sound) is the primary source from which the universe has sprung (in the Bible: "in the beginning it was the Verb"); it is the primordial vibration presents in every thing, the motor of the universe. Through the study and the search on the mantras the ancient wise man have discovered how we can be in harmony with the cosmos and with ourselves. ॐ (Aum) it is the primordial sound, is the matrix of all that exists in the universe. it doesn't have a particular meaning, it is rather a sacred syllable that represents the essence of the vital energy from which the creation has sprung. ॐ is the combination of three sounds: A - U - M. The A represents Brahma the creator, the conscience, the state of vigil. The U represents Vishnu the preserver, the subconscious, the state of dream. The M represents Shiva the destroyer, the unconscious, the state of deep sleep. It can be noticed as these three letters are tightly correlated with the endless breath of the universe, in which the three strengths of creation, preservation and destruction continually follow one another and how they are correlated with the three dimensions of the human conscience. The utilization of the sounds for spiritual purpose is universally used. In a lot of religions the continuous repeating of a sentence or a sacred sound with the help of a rosary (japa mala) represents the highest form of meditation. The mantras are the best vehicle in the meditation because through them the mind calms the incessant flow of thoughts and it settles in a state of deep concentration. Bija means seed, root. It is a very powerful Mantra that usually consists of a single syllable. The Bija Mantra evoke particular aspects of nature or of the divine, each Devata has his or her own Bija. 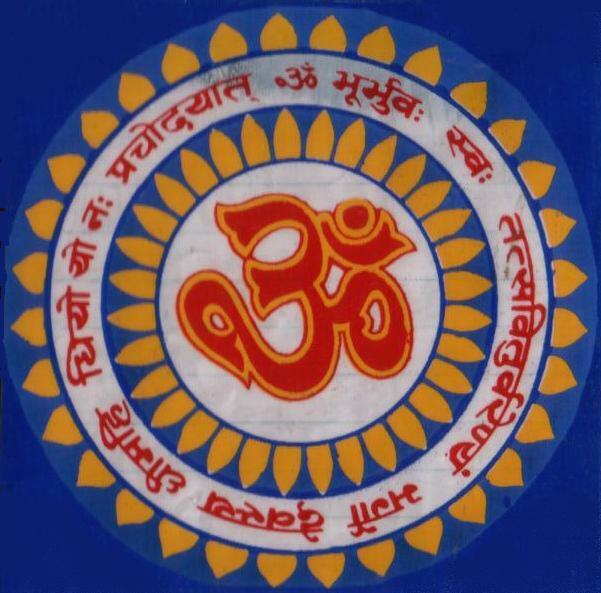 The greatest of all Bijas is Om or Pranava, because it is the symbol of Para-Brahman. who has a compassionate and gracious face. I meditate on Him for the removal of all obstacles. May we attain that excellent glory of Savitar the god. May he stimulate our prayers. These two mantras are very powerful and can be recite in the morning as soon as awake. Before opening the eyes you have to pass the palms of the hands on the face, then hold them togheter. Opening the eyes, you'll recite the mantra of the awakening looking only at the palms. Then for seven times you'll recite the mantra passing the hands on the whole body. At the end you'll recite the Ganesh mantra. Protect me, protect me, protect me. White as camphor, the avatar of Karuna (god of Compassion), adorned with the garland of the Serpent King, ever dwelling in the lotus of my heart, to the Lord and Lady, Shiva and Shakti together, to them I bow down. Om! May the Absolute Reality protect us. Let the studies that we together undertake be effulgent. Aum May Mitra be blissful to us. May Varuna be blissful to us. May Aryaman be blissful to us. May Indra and Brihaspati be blissful to us. 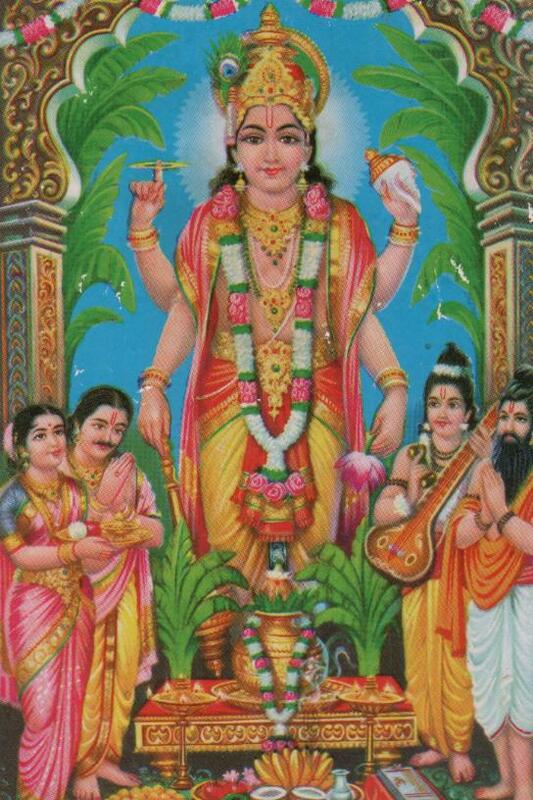 May Vishnu, of long strides, be blissful to us. Salutation to Brahman. Salutation to you, O Vayu. You, indeed, are the immediate Brahman. You alone I shall call the direct Brahman. I shall call you righteousness. I shall call you truth. May He protect the reciter. from that Whole, this Whole is manifested. that Whole remains being the Whole. Narmada, Sindhu and Kaveri; Please be present in this water. Oh Narayani, Oh Shivi, Oh Gauri you fulfil the desires of all. I offer my obeisances to You. You who are perpetually endeavouring to protect the weak and the poor and remove their misery. Oh Narayani, I offer my obeisances to You. Oh Goddess Durga, please protect us from all kinds of fear. Oh omnipotent Durga, I offer my obeisances to you. Oh Goddess, when you are pleased you remove all ailments and when you are angry you destroy everything that a person desires for. However, those who come to you for sanctuary never have to confront any catastrophy. Instead, such people secure enough merit to provide shelter to others. Whoever listens to the story of the Goddess succeeds in overcoming all obstacles and is blessed wealth and progeny. Oh Goddess, you who are known by the names of Mangala, Kali, Bhadrakali, Kapalini, Durga, Kshama, Shiva, Dhatri, Svaha, Swadha, I offer my obeisances to You. Oh Goddess, bless me with good fortune, good health, good looks, success and fame. Oh Vaishnavi, you are the very basis for the world. You have mesmerised the World. When you are pleased with some one you ensure his salvation from the cycle of life and death. In this pious dawn i worship Lord Ganesh who is the only Leader of Lords, his cheeks are glorified with vermilion and he is the one who removes all sorts of obstacles in ones goals and targets. I worship that form of Lord Surya (The Sun) whose face is compared with Rigveda, Kaleva is Yajurveda and rays are like Samaveda. Who is the whole mighty for this universe, just like Lord Brahma and Lord Shiva and his forms are ideal to concentrate and has got no other substitute. I worship Lord Vishnu who is the destroyer of all sins in this world. He is seated on Garuda. His eyes are just like Lotus. He is also known as Shree Narayan. I pay my devotion to Him. I worship Lord Shiva who is the destroyer of all sorts of fears in this mortal world, Masters of Lords, Whose vehicle is an ox and he is the originator of holy Ganga. He has Khatvanga (a sword in hindu mythology) and Trishul (Trident) in his hands. He is considered as boon to come over out of this mortal world. She is like the moon of winter, glorified with marvelous earrings and necklaces, having divine weapons in thousands of Her hands, Her feet are having an aura like red lotus. She is Goddess Durga, I worship Her in the pious dawn. After worshipping Lord Brahma, Vishnu and Shankara (Shiva). I bow for the Sun, Moon, Mars, Mercury, Jupiter, Venus, Saturn, Rahu and Ketu. May all these planets be prosperous for me and this day must pass with all happiness and prosperity. I surrender to Hanuman who is as quick as the mind. Fast and strong like the wind. Supreme among all intelligent beings. commander of the army of monkeys and the messenger of Lord Rama. I can find refuge at his feet. The Guru is Brahma, the Guru is Vishnu, the Guru is Maheswara (Shiva). The Guru is Verily the Para-Brahman (Supreme Brahman); Salutations to that Aghora Kula Guru. Om. Salutations to the guru, who is Shiva. His form is an embodiment of Sat-Cit-Ananda (Existence - Consciousness - Bliss). free from all support, and luminous. Salutations to the Guru whose form is the incarnation of Sat-Chit-Ananda (Existence - Consciousness - Bliss). Dispenser of happiness and prosperity, my fire, my light, infinite and immortal, calm, formless, mindless, universal, omniscient, You are the creator, you are the fear of fear, the reliever from troubles. Lord of the Gods, Lord of the Yogis, Lord of life, Supreme Lord, God. Salutations to the Guru whose form is the incarnation of Sat-Chit-Ananda (Existence - Consciousness - Bliss). My tributes to the God full of bliss. My tributes to the Guru. My salutations to those who are not terrible, to those who are terrible, and to those who are both terrible and not terrible. Everywhere and always I bow to all Rudra forms.